Helen has been doing yoga and massage for 10 years. From home and at external venues. 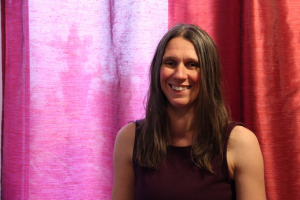 I started practicing Yoga in 1999 with my Mum at Pam Trounce’s class in Rumney, as a result of the benefits and effects I experienced, and my life changing direction, I decided to train to become a Yoga Teacher. I qualified following three years of study with Fay Beddowes through the British Wheel of Yoga in 2004 and have been teaching since. Over the years my practice, experience and exploration of Yoga has deepened. I have been inspired my many different teachers and teaching styles. As a result the classes I teach are an eclectic mix of styles. Mainly I am interested in encouraging movement of the body with greater awareness to free it up! After completing my Yoga Teacher Training, I had the study bug and decided to train further as a massage therapist, in Aromatherapy and Indian Head Massage. I completed basic Sports Massage training so know the techniques to delve a little deeper into problematic muscles. I have been receiving the cumulative benefits of massage on a monthly basis for at least 10 years from my friend Jen Davies who also inspired me to train in giving massage treatments. I have also studied and practiced Reiki levels 1 & 2. Recently I took Redundancy (in March 2017) and took the decision to move towards a full time life style as a yoga teacher and massage therapist, I would love the opportunity to share my knowledge with you and to encourage a deeper connection to yourself.